Mr. Angel Gurría, Secretary-General of the OECD, was in Israel on 31 January - 1 February 2016 on an official visit and to commemorate the 5th anniversary of Israel's accession to the OECD. He held meetings with Mr. Benjamin Netanyahu, Prime Minister of Israel and Mr. Reuven Rivlin, President of Israel, as well as with most of the Cabinet Ministers. 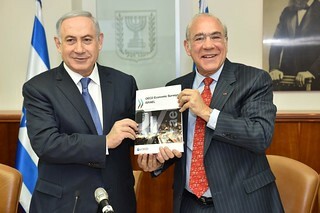 While in Israel, the Secretary-General presented the OECD Economic Survey of Israel and the report Measuring and Assessing Well-Being in Israel. At the Ben-Gurion University of the Negev, Be'er Sheva, the Ben-Gurion Leadership Award was presented to the Secretary-General. Presentation of the Economic Survey of Israel 2016. From left: Benjamin Netanyahu, Prime Minister of Israel and Angel Gurría, Secretary-General of the OECD.